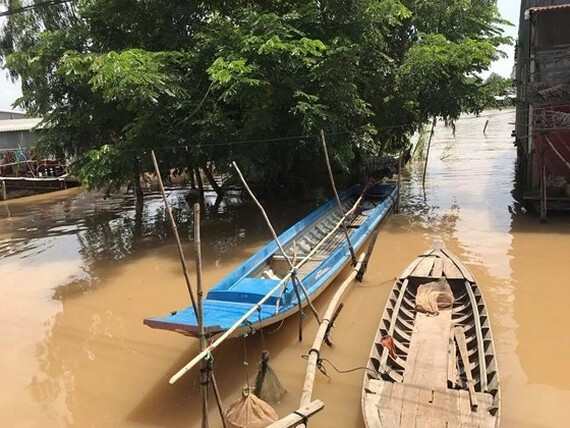 The National Center for Hydro Meteorological Forecasting said The Mekong Delta’s floodwater is forecast to rise in the next three days and then reduce until September 20; on September 25 the water level is expected to rise quickly to peak at 4.2m. This morning, the center issued the water levels in the Mekong Delta region are rising slowly however it will peak at 4.2m on September 25. At 7am September 11, the water level was measured at 9.65m at Vientiane-Laos Station; 9.46m at Stung Treng Station (Cambodia) and was reducing compared to previous days. However, floodwaters in Mekong’s downstream are still high and may increase due to high tides in the region. In the next 2 -3 days, it is forecast that the water level on Mekong River will continue to rising up. On September 13, it will reach at 4.13m, above warning level 2 at 0.15m at Tan Chau Station; 3.8m at Chau Doc Station. On September 20, the water levels will reach its peak at 4m at Tan Chau Station, warning level 2; at Chau Doc Station 3.6m, above warning level 2 at 0.1m. However, due to high tides, the water levels will then rise quickly to peak at 4.2m at Tan Chau Station. In lowland areas along the Mekong Delta provinces such as Kien Giang, Long An, An Giang, Dong Thap are predicted to face the flooding; the dyke system may break.